Tired of the traditional carriers and their BS? Why not make the switch to Google’s Project Fi. 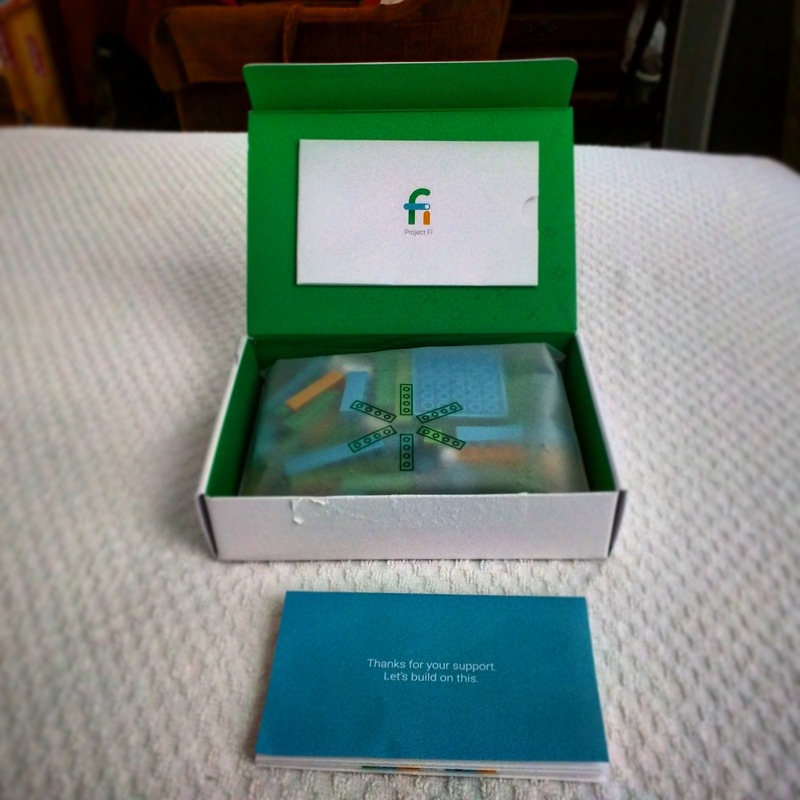 Project Fi is basically Google’s take on what a cell carrier is supposed to be. In a word everything should be simple. Wi-Fi predominate network, In other words it a network that will choose Wi-Fi first for the best and cost effective connection. When not connected to Wi-Fi or out of range Project Fi will connect to either T-Mobile’s Super Fast 4G-LTE network or Sprint’s LTE Network. If you want to know how the coverage is in your area check out Here. Plans are about as simple as you can get. There are no surprises or contracts. 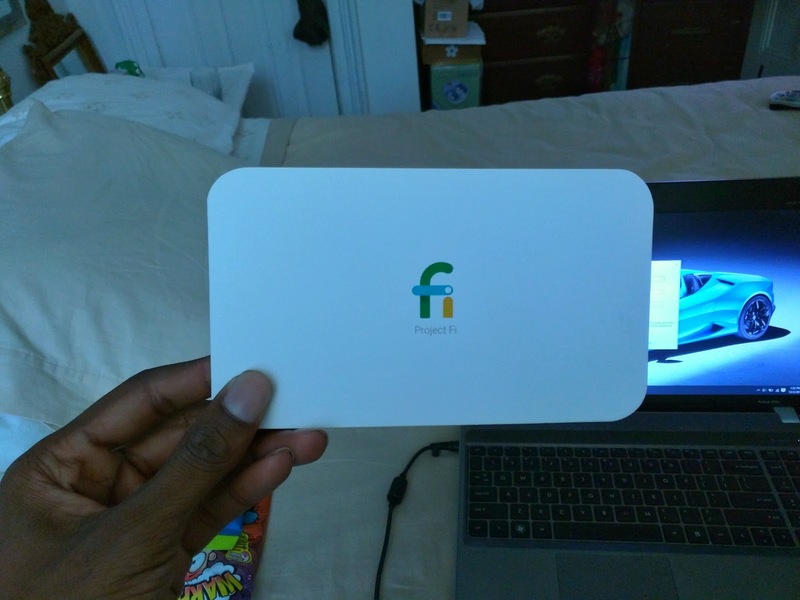 You pay for the Fi Basics which is $20 (this is for unlimited voice and text) . Then you pay $10 for each Gigabyte of data that you want. Best part about this is that you don’t pay for data that you don’t use… You will get that money back. If you go over the data just pay $10 for another Gig.. For more info on plans go Here. Call and Text from all of your devices via Google Hangouts. Seem-less Transitioning between Wi-Fi and networks. Simple yet functional Project Fi app. Money back for data you don't use. Coming from T-Mobile i miss the Music Freedom. Originally I wasn’t sure how i was going to feel about switching from T-Mobile (Where i have been for the last 8 years) which had so many perks, to basically a start-up carrier. A couple of issues (not gonna go into them) pushed me into making the switch, and now i feel kinda indifferent. The biggest thing I miss is the freedom of Music and now some streaming services that T-Mobile provides. Besides that I couldn’t be more happier over here at google. In all Honestly I like not having my data throttled after I reach the 1GB cap. I enjoy having much faster data speed, don’t know why but they were much slower on T-Mobile even though they are using the same towers… I enjoy paying less (in theory the plans are the same price but at T-Mobile i was paying $50 a month for Unlimited talk, text, and Data up to 1GB for 4G LTE. 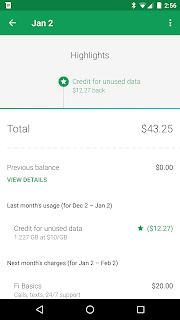 On Project Fi I’m paying $50 for Unlimited talk and text, and 3GB of 4G LTE data. 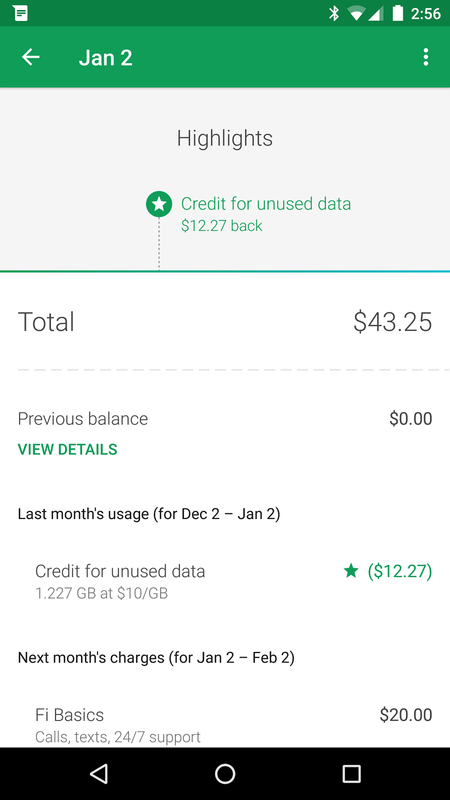 Last month i didn’t use up all my data; actually i only used 1.7GB which mean i get $13 off my next bill putting my January Bill. In the end I'm enjoying Project Fi but will wait a few months before passing final judgement on it. If you have one of the newer nexus phones give it a try to see if it works for you.